Version 4.0 custom boxed card set of 41 essential competencies within 7 clusters. 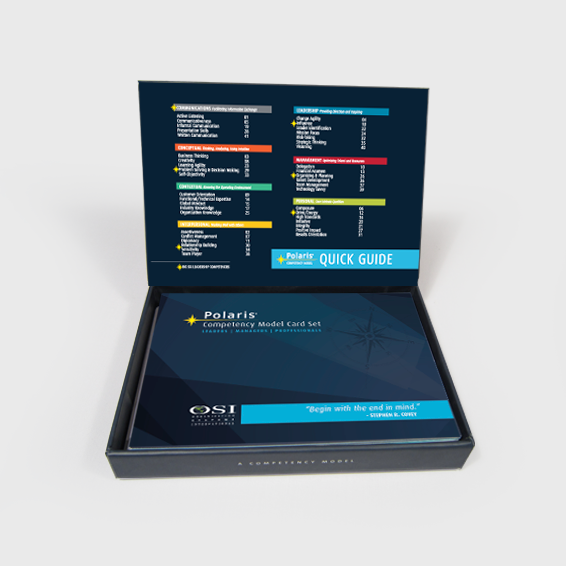 Includes specific instructions on how to use the Polaris® competency cards to define roles and perform needs analyses. Used as the criteria for defining the “ideal state” needed in selection, performance management, and training. Each card contains a rich description of the competency with tips for application and suggested behavioral episode interview questions. Cards can be applied across all leadership, management, and professional roles. This version also includes a highlighted subset of Polaris® competencies (The Big Six) that have been found to predict exceptional performance in front line leadership roles. **This product can be licensed; contact OSI for further information.